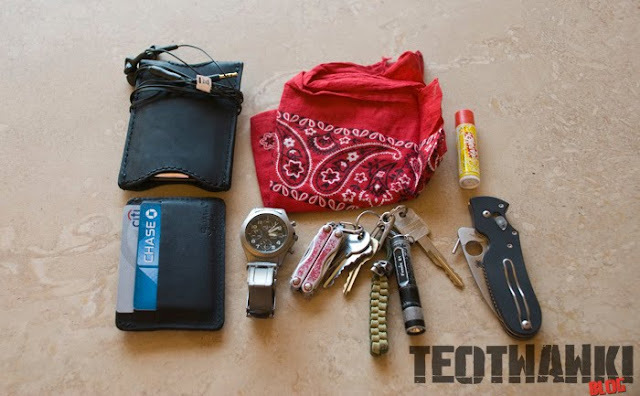 > TEOTWAWKI Blog: Pocket Dump! The Saddleback stuff and the P'Kal are new, and I'm liking them quite a bit. The P'Kal is scary sharp, really well made, and opens lickety-quick with the wave-feature. The pocket clip and axis-like lock are a little stiff but starting to wear in nicely. It's the highest-quality folder I've ever owned, and so far not disappointing. The Saddleback Leather stuff is nice looking and very tough. I love the iPod sleeve, and the wallet is pretty cool, though a little on the small side and in need of breaking-in. I moved from a bigger Eagle Creek Bi-Fold that had quite a bit more room, so a few less-used cards had to be left out, and the card/cash slots are very new and tight--they will certainly loosen up with wear.